With their 2010 album ‘The Never Ending Way Of ORwarriOR’ Israeli Progressive Metallers Orphaned Land not only confirmed themselves as one of the most innovative, interesting and talented acts around, but also introduced themselves to the wider conscience of Progressive music lovers worldwide. Combining traditional Middle Eastern themes with crushing riffs, blistering solos and growled (and predominantly clean) vocals, Orphaned Land really are a unique act, but one that remains remarkably accessible, if satisfyingly challenging. Add to that the band’s desire to cross religious boundaries (lyrics on this DVD are sung in English, Arabic, Hebrew and Yemeni) and you really do have an outfit breaking both musical and cultural boundaries. ‘The Road To OR-Shalem’ finds Orphaned Land celebrating their 20th anniversary in front of a frenzied home Tel Aviv crowd, where Israeli flags are waved right next to those from Lebanon, creating a joyous atmosphere packed with energy - something which the band visibly feed off, with the shots of the crowd jumping and punching the air to the music really being rather inspirational. The DVD itself is no cheap and cheerful production, with crystal clear sound and the multiple camera angles being utilised to full effect and whether the shots are taken from the body of guitars, the neck of the bass, inside the kick drum, or any of the other more expected locations, the action is fast and furious as it sprints to keep up with the boundless energy that Orphaned Land emit. Unsurprisingly the set focuses mainly on the band’s latter two of three releases, with the heavier moments from ‘Mabool’ and ‘...ORwarriOR’ becoming live hammer blows, while the more subtle sections bring added poignancy and emotion to their studio counterparts. A few friends join the band on stage to help the celebrations, with the most notable being Porcupine Tree’s Steven Wilson (who produced ‘...ORwarriOR’) dueting with lead “chanter” Kobi Farhi on ‘M.I. ?’ and surprisingly providing a solo acoustic performance of OL’s ‘The Beloved’s Cry’ as the opening encore. Fahri himself is a tremendous singer and showman, but that doesn’t stop guitarist Yossi Sassi Sa’aron and drummer Matan Shmuely from stealing the show on numerous occasions with their fantastic musicianship and infectious stage presence. However it is as a band that Orphaned Land truly shine, with each and every song whether it be a Metallic workout, or a gentle voice and bouzouki lilt, hitting home with power and precision, especially when second vocalist Shlomit Levi adds her awe inspiring tones to the intoxicating mix of Metal and Progressive. 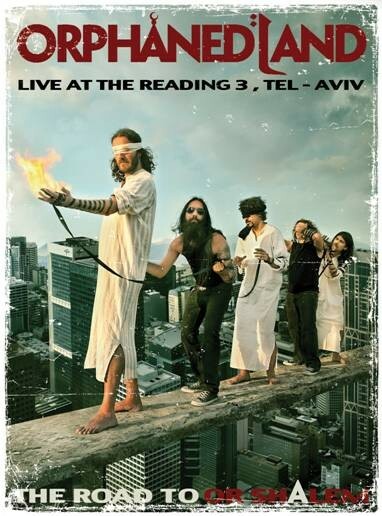 ‘The Road To OR-Shalem’ is by far the best live DVD performance I’ve seen in quite some time and I’d go as far as to say that it is also the best thing Orphaned Land have released. For those who like music that challenges and lyrics which truly make you think, this is a release not to be missed - oh and if that wasn’t enough a second disc adds five exclusive bonus tracks and a tremendous 30 minute documentary to an already indispensible set .